JOHN IRELAND (1879-1962): A Cradle Song, Weep you no more, sad fountains, Laughing Song, The Peaceful Western Wind, Spring, the sweet Spring, When May is in his prime, Cupid, Fain would I change that note, Twilight Night, These things shall be, The Hills, Immortality, They told me, Heraclitus, Sea Fever (arr. Mansel Thomas [1909-1986]), In praise of Neptune, E.J. 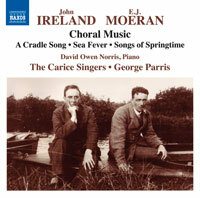 MOERAN (1892-1950): 7 Songs of Springtime, The Blue-eyed Spring, Weep you no more, sad fountains, Phyllida and Corydon. Description: Ireland is little known these days as a composer of partsongs. His deep understanding of choral forces brings a unique polish and artistry to the genre, his early style reflecting a deference to his masters Parry and Stanford, and deeply moving post-war masterpieces such as Twilight Night exploiting a more acerbic harmonic vocabulary. Moeran's inclination towards introspective melancholy blends with his knowledge of Elizabethan madrigal and renaissance dance and his 26-minute “Choral Suite” phyllida and Corydon conveys all the multifarious aspects and emotions of love in pieces of significant scope and difficulty. The Carice Singers; George Parris.